Like I said before, shipping is the most difficult part of fandom. You cast your lot on two people’s fates, two people you don’t know, and you don’t even know if they really like each other beyond what is public or what you believe in. But that hasn’t stopped anyone from being a shipper. Certainly, not me. However, I can count with my one hand the pairings I have shipped or shipping. And when it comes to my ships, I ship them primarily because of offscreen-related reasons, and the onscreen chemistry is just a secondary reason. I love BTS stories. They capture my interest more than what is shown onscreen, scripted, directed and measured. 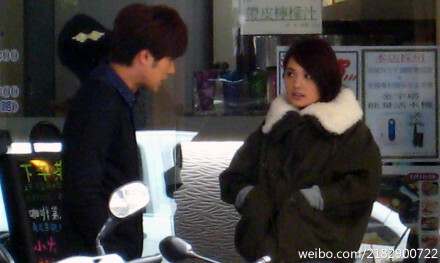 She visited him on the set of his LOVE KEEPS GOING drama the first day he went back to work after being down with the flu. Photo uploaded on Weibo by one of the drama staff. Taken after dinner between the two lead stars of THAT WINTER THE WIND BLOWS and their director and scriptwriter, while they stood on the streets of Seoul before parting ways. and for the third one, a DISCLAIMER first: I like boys for girls. I like boys for me. But they make my heart go doki-doki. Paparazzi photo taken during the 5×10 concert tour. It’s emotionally draining to be a shipper. Been there, done that. But sometimes, I just can’t help it. It’s better to believe in love than in hate, anyway. Here for the Sakumoto. Ohmmmyyyyy.